It has become trendy among politicians and the media to portray the EU as a faceless horrifying monster which has caused the crisis that Europe currently faces. Nothing could be further from the truth, writes Marlene Wind. Marlene Wind is a professor of political science and law at the University of Copenhagen. A few weeks ago, the Swiss research institute Media Tenor published an analysis, which showed that British broadcaster BBC, over the last 15 years, had provided more negative coverage about the EU than about Vladimir Putin. While it has long been posited that the BBC is too EU-friendly, it is now a documented fact that only 7% of the BBC’s coverage over the last 15 years was EU positive. Last year alone, 45% of the coverage was directly negative – the same score as Syria’s Bashar al-Assad, while Putin’s comings and goings were only mentioned negatively in 30% of the its news coverage. We all know the EU angle of the British tabloids, but few had probably expected the same from a government-funded stronghold like the BBC. Especially now that the British are about to find out whether they want to stay in the EU, it is obviously worrying that the BBC has been so one-sided and consistently negative in the framing of their EU stories. Though it has always been there, talking the EU down is – it seems – the new big trend in national news media coverage, and not something reserved for the British broadcasters. Recently the Danish daily newspaper Berlingske – which earlier had a very pro-EU profile – decided to publish a two-page unspecified EU-negative interview with Foreign Minister Kristian Jensen (Liberal). 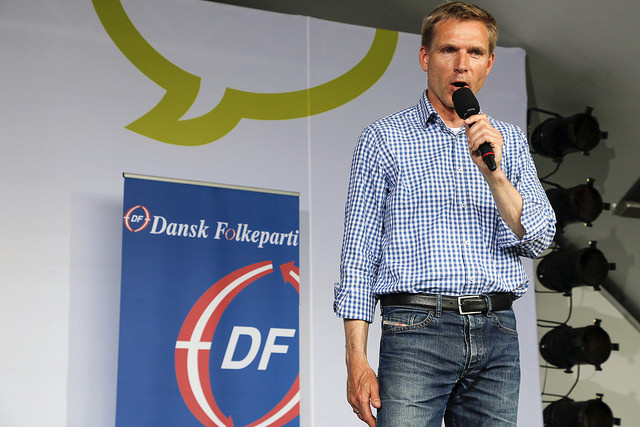 The day after, the Danish People’s Party leader, Thulesen Dahl, was lucky to get the same huge attention. Two whole pages and no critical questions asked. What the editors thought was important for the Danish readers to know was (surprise!) that Mr. Thulesen Dahl wanted to follow the Brits out of Europe if Brexit happens. Don’t get me wrong here. Well-placed and relevant criticism of the EU (as of national politics) should always be welcomed. The issue that I am trying to address here is the repetitive news-framing of EU related problems as something that is always fostered in Brussels – never in the national capitals. If the survey of the BBC’s EU coverage and the case of the Danish (most cited) daily are not a symptom of a bigger tendency, it would of course be of minor importance. However, what characterises the debate on Europe everywhere at the moment, is an unprecedented mockery and even contempt for the joint project, which brave politicians and intellectuals painstakingly built up on the ashes of World War II. In other words, it has become hip to be Eurosceptic. It provides a tailwind for any political impersonator – commentator or editor – who wants to be popular and make themself interesting. However, regrettably the EU blame game is rarely – if ever – followed by the slightest vision of what should replace the EU we know. What is almost even worse than negative framing and popular editorial EU-bashing is the constant and it seems continuing mixing up of who the EU actually is. If you ask politicians and commentators in the news, they constantly blame the EU rather than the national capitals for the malaise of Europe. In addition, as an EU-expert in Denmark, I consistently receive questions from journalists like: ‘Why is the EU so bad at handling the refugee situation?’ and ‘Is the current crisis not a good example of a completely failed EU project’? But who is the EU and who is to blame here? Is it really ‘excessive bureaucracy in Brussels’ that doesn’t deliver on the results? Or rather, the national heads of state and governments who currently live in denial passing on problems – like asylum seekers – to each other? The EU is not an abstract monster and does neither more nor less than what the member states want it to do. The European Commission (which journalists often use as alias for the EU) does not make decisions by itself. It proposes solutions on everything from climate change to banking regulation and trade. The latest example is a common refugee policy. So no. The Commission has NOT been sitting idle watching refugees invade the borders of Europe. On the contrary, it has for years warned that even very large refugee flows were a political risk that should be taken very seriously and not least acted on. But what has happened? National political leaders have resorted to their worst instincts in this crisis and relied almost entirely on national measures of wire, teargas and taking jewellery from refugees. The policy that has almost put the EU’s precious Schengen zone in the ground is a complete scandal and an embarrassment to us all in Europe. Blaming the EU for what national politicians – with a few exceptions – must be sole responsible for, is outright wrong. Ms. Merkel has of course been an exception in this respect but she is increasingly being ridiculed by politicians and commentators in the national media for her open door policy. What she did was to be a leader hoping that everyone else would follow. Had the EU followed her and divided the refugees between them there had been no problem at all. What I am saying is not that Europe should leave its borders wide open. On the contrary, the EU needs to take back control of its own external borders. Europe’s refugee policy should not be left to reckless smugglers and Putin, who with a confident smile on his face currently watches what he most wants to see: incompetent European leaders who – by their own hand – send Europe against a slow, but painful death. We are witnessing a failure of dimensions in European history. Not by the EU, but by modern political leaders who are actually afraid to lead. It is an illusion in both the Brexit campaign and in most other European capitals that you become more independent as a nation by standing alone. Nothing would be more wrong. The fantastic thing about a collaboration as the one we have in Europe is precisely that – even as a small nation (which the Brits actually are the big picture) – you have a chance to influence the world constructively. Leaving the EU, you will sail alone on an unknown big ocean. This was Obama’s message to the British when he visited them a few weeks ago. This would apply tenfold for us in Denmark. And how does Euractiv counteracts the apparent trend? It gives in to populism by e.g. blaming farmers about pollution while it stays silent for cars; It feeds in the GONGOs that make whatever will not upset their funders; It silences itself about the lost airplane from Egypt to Paris, while other media in other countries cover it extensively; It silences about the civil uproar in France on the labour legislation reform….and…and …and. So please @editor’inchief’ try seeing yourself befor pointing the finger to others (which might rightly be also to blame). I don’t think anyone has ever accused EURACTIV of being non biased or investigative in their news reports. A whole library could be written on the subject of the damage politicians do. You would not recognise facts if a tonne of them fell on you. That’s not to say that the BBC is not under pressure from politicians; on the Government and the Opposition side. By and large, the BBC attempts to be even-handed. Yet, this is indeed difficult where the EU is concerned. We in Britain are largely reliant upon news from the EU being first fed through a Party Political filter. Our political system – for good or ill, is an adversarial one. I accept the points the author makes about the craven nature of our political class, the EU has joined many other institutions that are regularly used as political-footballs, and shields for home-grown incompetence. Could the European Commission not provide its citizens with an annual ‘State of the Union’ report? – What is the Commission’s attitude to the proposals of DiEM25? – What is the Commission’s stance on Transnational Parties, with regard to the 2019 EU election? Pro EU commentators love the idea that the media in the UK is totally biased against the EU, thus explaining what they see as the irrational euroskepticism of those living on the rainy island. This piece is a classic of its sort. The UK print media have a wide range of views on the EU, from the rabidly anti EU Daily Express to the markedly pro EU Daily Mirror with others publications fitting along the spectrum. The fact that a person presenting themselves as a serious academic is not pointing these basic facts suggests their own bias is not being controlled in this journalistic piece. With regards to the balance between national capitals and Brussels, it seems to me it depends where your capital is. If you live in Athens you have very little control over your country. A fall in GDP of 27% while under tight control of the Troika (together with the repeated refusal to write down debt) indicates this is indeed the case. Yet if your capital is Berlin, you can unilaterally declare open house for what you alone decide are refuges and then expect others to follow without consultation. When they object you simply push the policy through using QMV. The rise of AfD and the fact that attacks on migrants in Germany have soared seems that it is not just other European political leaders have not followed Chancellor Merkel, but a very significant (majority?) proportion of her electorate. A group of states only have influence as a whole if they all pull in the same direction. The reality is in the case of the EU it is difficult to identify any policy area where there is anything approaching unanimity, whether it be economics, trade, defence, foreign policy, social affairs, etc. As such to claim the EU has more influence than a state like Germany or France is frankly laughable. If Britain develops the gumption to leave the EU other countries will follow. They are looking for a leader to stand up to autocratic Germany. Why UK seems not able to provide such a leader ? Why a leader from Germany would be not acceptable ? Hitler disappeared long ago : still afraid ? Does that explain why coverage of the mass rapes in Cologne on New year Eve was so prominent on Euractiv and why there was such award winning coverage of the Flight cancellation from Terminal 1 at Cologne Airport when security was breached recently? Perhaps the Commission is planning to jam Breitbart inn a manner similar to the jamming of the BBC during the Cold War. Such blatant manipulation of News feeds is exemplar for neo fascist organizations is that not correct Herr Junker? Britain cannot exit the EUSSR lunatic asylum fast enough. Germany’s leader will now have her way with her favorite sock puppet Hollande.Say goodbye to Thousand Year Reich number three. It is funny how pro EU fanatics squeal when the media report the truth. The fact is the EU was an experiment to solve the problems of the last century, it as failed utterly & as no place in this one. You forget that the States (Eu Council) have the last word when decisions are made. The Commission only creates rules from these decisions. I agree with you about the lack of democratic process, the Eu Parliament being blocked by the States. UK (i.e. your governments since Thatcher !) has not been the last to fight any tries made by the Eu Parliament to get some power. What did you do to correct this ? You just leaving … The problem is within your state like it is in mine. The liberal left has used the term racist so often it now has no meaning and can be seen as a libertarian badge of honour. The BBC is horrendously pro EU in its bias. ” The EU is not an abstract monster and does neither more nor less than what the member states want it to do. The European Commission (which journalists often use as alias for the EU) does not make decisions by itself. It proposes solutions on everything from climate change to banking regulation and trade. The latest example is a common refugee policy. Really where I sit in one of the offshore islands possibly designated as a holding area for economic migrants (the UK), based on the handling of the Horse meat scandal I see an organisation which has infantilised national authorities and terrorizes them to the point of inaction.